Illinois researchers used ultrafast pulses of tailored light to make neurons fire in different patterns, the first example of coherent control in a living cell. 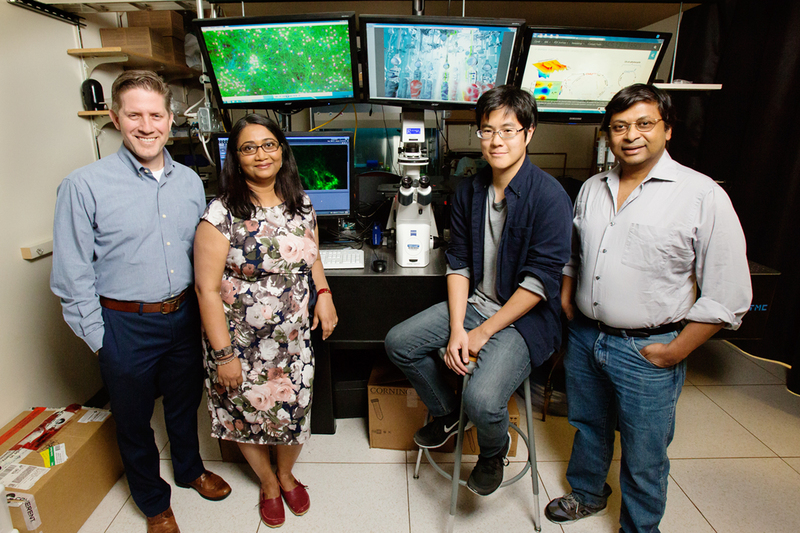 CHAMPAIGN, Ill. — Specially tailored, ultrafast pulses of light can trigger neurons to fire and could one day help patients with light-sensitive circadian or mood problems, according to a new study in mice at the University of Illinois. Chemists have used such carefully crafted light beams, called coherent control, to regulate chemical reactions, but this study is the first demonstration of using them to control function in a living cell. 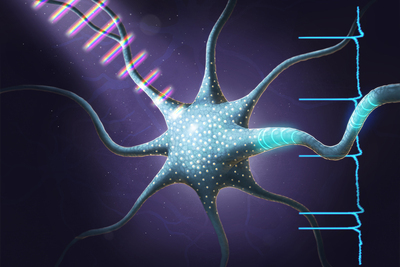 The study used optogenetic mouse neurons – that is, cells that had a gene added to make them respond to light. However, the researchers say the same technique could be used on cells that are naturally responsive to light, such as those in the retina. The group used advanced imaging techniques to monitor neurons and their activity. Pictured, from left: Professor Stephen Boppart, professor Parijat Sengupta, graduate student Eugene Ark and research scientist Kush Paul. “The saying, ‘The eye is the window to the soul’ has some merit, because our bodies respond to light. Photoreceptors in our retinas connect to different parts in the brain that control mood, metabolic rhythms and circadian rhythms,” said Dr. Stephen Boppart, the leader of the study published in the journal Nature Physics. Boppart is an Illinois professor of electrical and computer engineering and of bioengineering. Boppart also is a medical doctor and a professor in the Carle Illinois College of Medicine. While most biological systems in nature are accustomed to the continuous light from the sun, Boppart’s team used a flurry of very short light pulses – less than 100 femtoseconds. This delivers a lot of energy in a short period of time, exciting the molecules to different energy states. Along with controlling the length of the light pulses, Boppart’s team controls the order of wavelengths in each light pulse. The National Institutes of Health and the National Science Foudation supported this work. Editor’s notes: To reach Stephen Boppart, call 217-244-7479; email: boppart@illinois.edu.